I'm a creature of habit. There is definitely a part of me that loves adventure and discovering new things but, in my day-to-day schedule I stick to a routine so I don't have to dwell on those aspects of life. As I mentioned in this post, things have been feeling off for me lately so even the "normal" things feel different. For a person like me, that is unsettling. Regardless, we all do what we can to keep calm. Right now, having things that comfort me makes me feel better. A cup of chai, some flowers, ice cream or this ol' trench. It's not the best quality or the best fit but it sure gives me comfort when I need it. And that alone gives me reason to hold on. I think the trench is cute! I have my eye on a Coach trench but it' way expensive...though I know I';; wear it all spring long. Nothing wrong with a great trench coat! Especially transitioning into spring! I love the stripes and hat as well! Possibly one of my fave outfits on you, girl! Love this entire look, you nailed it! 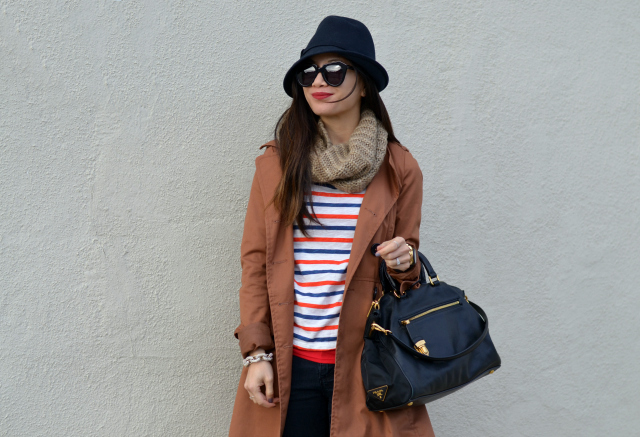 I love the color of the trench, its a twist to a classic and you definitely pull it off !! i love your trench. seriously adorable. i love everything about this outfit, and its perfect for the rain we've been having. hope things get feeling better soon. Oh, I love this all. The stripe shirt which is classic but with the alternating lines a little different too. 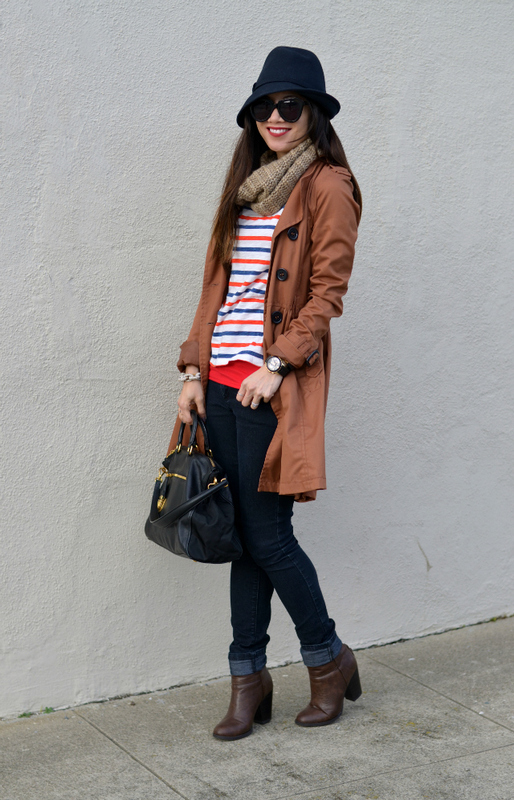 The trench and jeans (love the rolled up cuff detail) are so delightfully timeless and you wear them well. Love the freshness of the t shirt. I hope things are looking up for you Nancy. I am so envious that you scored this jacket for just $5!! Even if it's not great quality - it looks great on you and such great layering outfit. I am definitely a creature of habit too, adventures are fun but everyday life is good when it's comfortable. 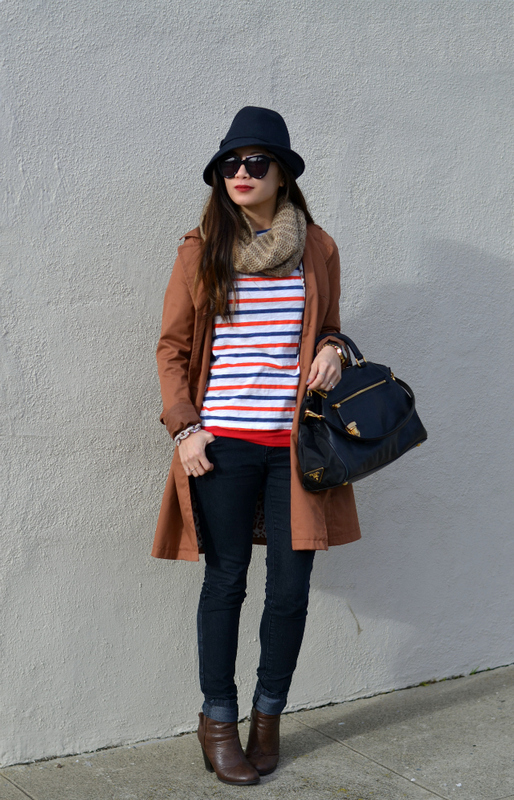 Love this trench, it's perfect with the striped top and denim. Looking good! 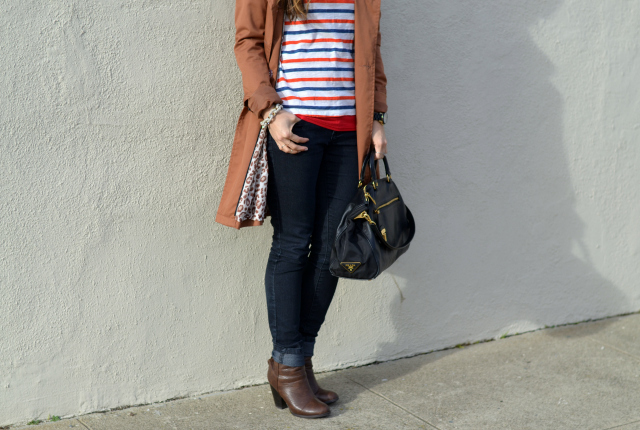 I love the stripes + the trench, you look beautiful! 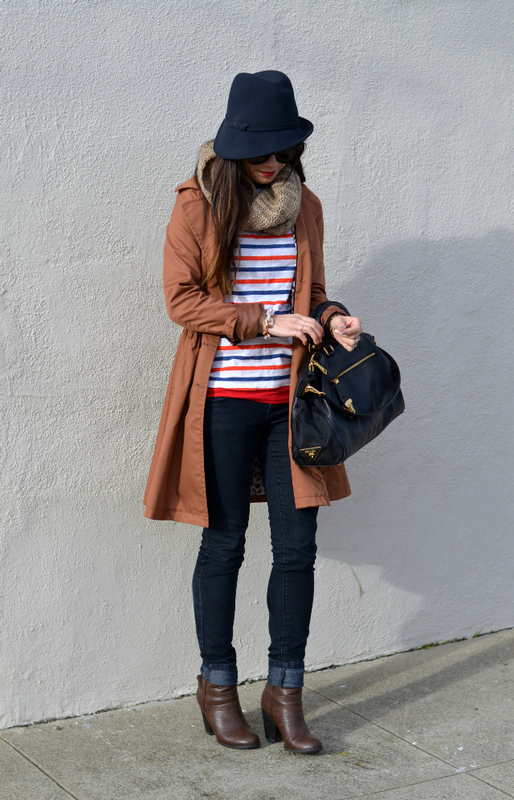 Hang in there hun :) Love the hat paired with the trench. It looks great on you and I love your top. i've been looking for the perfect striped tee for awhile!